Davis was born in Bermuda in 1991 to a family with a history of working in aviation. His mother, Angela Eaton, worked for Pan Am as a flight attendant from 1988, and later moved on to work at Delta; while Davis’s late father, Denford Davis, worked in airport operations in Bermuda, where, co-incidentally, he worked with Herbert Siggins, who today is JetBlue’s General Manager in Bermuda. Mr Davis is a dual citizen of Bermuda and the United States. After graduating high school in Orlando, Florida, he served in the Royal Bermuda Regiment, and upon completing his service, he got a job as a ramp agent at Bermuda Aircraft Services at L.F. Wade International Airport. In 2015, he moved back to Orlando, which happens to be one of JetBlue’s six focus cities, where he was hired as a Customer Service and Operations Agent. 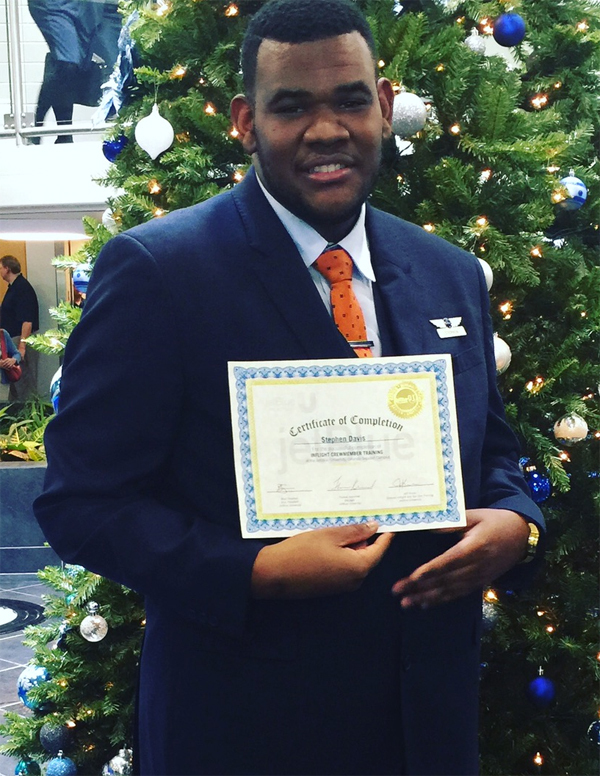 Davis was set on getting a job at JetBlue, and he waited patiently until finally he saw an opportunity he couldn’t miss out on and applied for it. By the end of 2016, Mr Davis was offered a position as an inflight crewmember for JetBlue. It has been two years since he joined the company, and Mr Davis is currently an Onboard Lead, serving in the Mint cabin, which is JetBlue’s premium cabin offered on certain routes. When asked about his hopes for the future, Mr Davis says that he wishes to help other Bermudians get involved in the airline industry, especially in his role as an inflight crewmember. Very proud for you, Mr. Davis. Yes, the sky is your limit. Go for it!! Hey congrats Stephen! Make sure to take a picture of you fly with Finnie Holder who is a pilot with B6. Fly high boss! Stephen, I saw that determination to succeed from your days in my class and I am so proud of you! Your dad always spoke highly of you and your accomplishments whenever I would see him. Continuing walk in excellence is something he would have been proud of! We are so very proud of you, Stephen! Wonderful to see you thriving. Congrats my friend! So happy to see an article done on one of my classmates 18-16! !